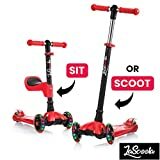 Whether it’s your little one’s birthday or you simply want to reward your toddler with a memorable gift such as a scooter, here you will find information that will get you one step closer to finding the best toddler scooter. Our team of researchers has examined various models and their specs as well as customer ratings and reached the conclusion that the first option to take into account is the Lascoota 2-in-1. What makes this product stand out is the fact that it has a removable/adjustable seat that will enable your toddler to use the unit as a ride-along as well as in scoot mode. In order to ensure easy and safe riding, the item features three wheels that will deliver the right balance while riding. The scooter is not only easy to operate and quiet but it is also durable thanks to the materials featured. Should you be unable to find this product, a reliable alternative in terms of quality is the Micro Kickboard Mini. Safety and ease of use are the main benefits your toddler will get to enjoy with this scooter. It features a three-wheel self-balancing design to provide the rider with enhanced stability and safety. The seat is removable and adjustable. Plus, the handlebar comes with four height options to accommodate kids as they grow. It is ideal for riders aged 2-8 and has a weight capacity of 110 lbs. Durability might be an issue as a few buyers mention. 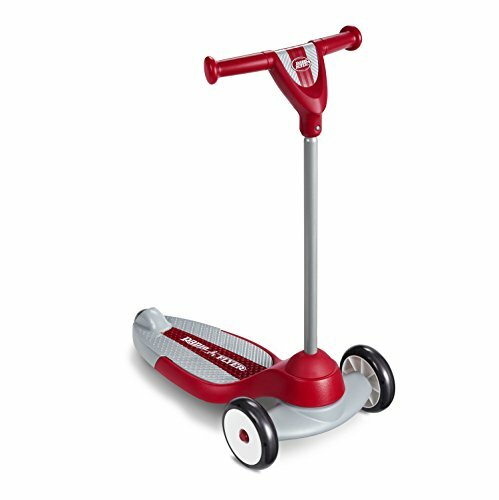 Consider this scooter if you want to help your toddler develop balance and coordination skills and do so safely and easily. Boasting a three-wheel and lean-to-steer design for enhanced stability, this model is also worth paying attention to. The unit features a low-to-the-ground fiberglass-reinforced deck as well as high-quality wheels to ensure a smooth ride even when used on bumpy surfaces. It will help toddlers develop balance and coordination skills by using their weight. It has a maximum weight capacity of 44 lbs. Some parts broke after a few uses, according to a buyer. Give this model a try if you’re interested in a three-wheeled scooter that is easy and safe to operate. It is ideal for kids aged 2 to 5. If you’re interested in enhanced safety, ease of use, and a durable design, you might want to check out this 3-in-1 scooter. It was designed to accommodate kids as they grow, therefore it can be used and customized for kids aged 1 to 5. It thus comes with a removable/adjustable seat that offers two height options. Moreover, it also boasts an anodized, adjustable T-bar. The upright design ensures stability. At least one user says the seat is strangely placed. Designed to cover the needs of kids aged 1 to 5, this model should not go unchecked. It has an adjustable design for comfortable riding. 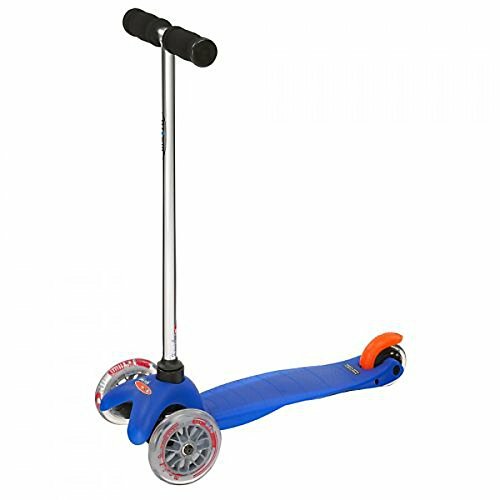 Although finding good toddler scooters might seem an easy task, things might turn out to be a bit challenging, given the many products available for sale. To simplify your shopping experience and help you make a more informed decision, we have compiled below a list of toddler scooter reviews, based on their specs and buyer feedback. If a three wheel scooter toddler is what you have in mind, this model from Lascoota is worth considering. Featuring a self-balancing design and thus three wheels, the scooter won’t just make your little one’s rides easy but also safe. The item promises to ensure quiet operation and enhanced durability. What’s great about this particular model is that it comes with a removable/adjustable seat, which means that the toddler can use it as a ride-along or in the scoot action mode. You can either remove it completely or adjust its height. For a custom experience, the handlebar comes with four height options, which means it can be used even when your little one grows. The unit is ideal for kids aged 2-8 and has a weight capacity of 110 lbs. The front tires are big enough to run smoothly even on bumpy terrains. The lean-to-steer technology used will help your little one develop coordination and balance skills. Because your kid’s fun should be paired with safety, this mini scooter should also be taken into account before you make your final decision. It was designed with ease of use and safety in mind, therefore it features a three-wheel and lean-to-steer design for enhanced stability. Ideal for preschoolers and kindergartners, therefore children aged 2-5, the unit will help users develop balance and coordination skills as the children will have to use their body weight to lean left and right. The low-to-the-ground fiberglass-reinforced deck and the high-quality wheels will absorb the bumps uneven surfaces have and ensure a quiet riding. The scooter has a weight capacity of 44 lbs. What’s also great about this model is that it comes with non-marking wheels, which means that your toddler can practice at home before taking it outside. The product has received several awards as well as positive feedback. 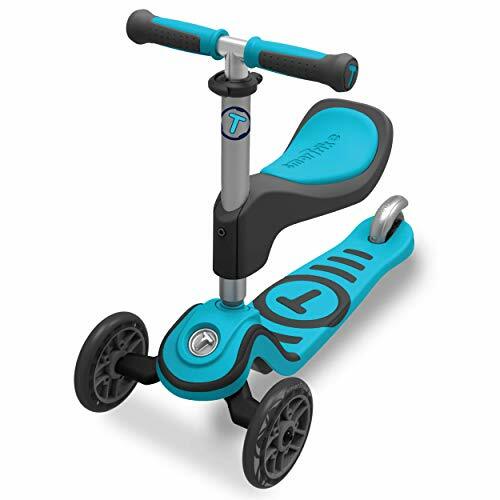 Designed for children of different ages, this award-winning scooter will keep up with your kids’ needs as they grow since it can be used by children aged 1 to 5. Getting this scooter thus means covering your little one’s needs for a longer time. The unit comes with an anodized, adjustable T-bar as well as a removable, adjustable seat. Therefore, at age 1, the scooter can be used with the ride-on seat that offers two height options for comfortable riding. In case your toddler is aged 2, you can remove the seat and turn the unit into a stand-on scooter with a short O-bar. 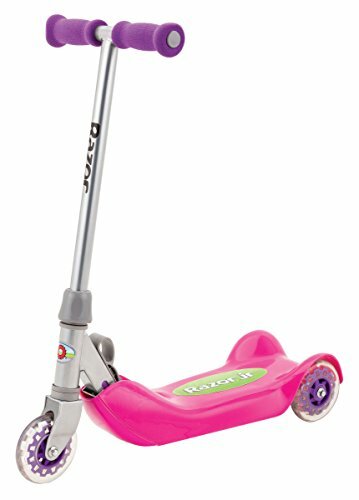 At age 3, you can customize the scooter for ages 3 to 5 by replacing the O-bar with the T-bar. To further enhance your kid’s safety, the 3-in-1 Deluxe scooter features soft edges as well as a stable upright design. Durability, safety, ease of use, and a compact design are the things your little one will get to enjoy with this scooter from Razor. Because safety is the no.1 priority, the unit boasts three wheels that ensure enhanced stability, a feature that will be even more appreciated by new riders. 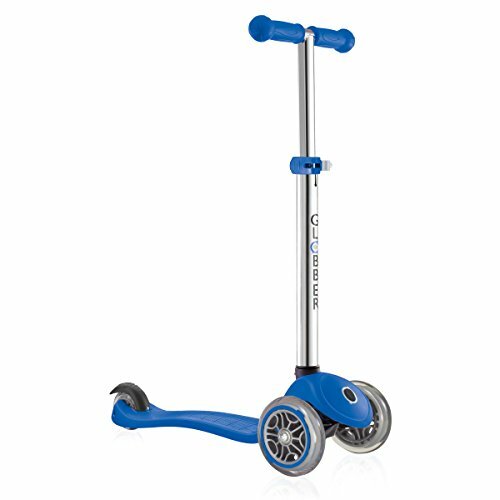 The scooter features aluminum, steel, and plastic parts to keep up with extended use. Moreover, the urethane wheels ensure smooth riding whereas the wide, slip-resistant polypropylene deck accommodates both feet comfortably. What makes this product stand out is the fact that it can be easily folded for easy storage and transportation. Assembling it is nothing complicated and requires little effort and time. 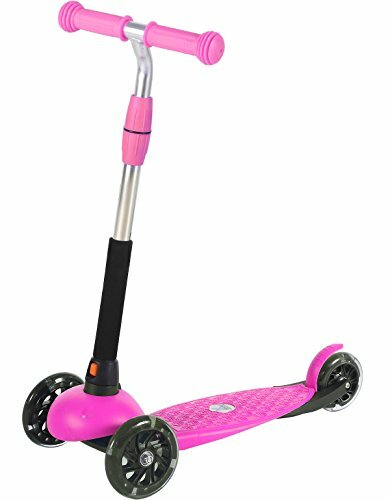 The product is available in pink and blue, therefore you can consider it whether you need a toddler girl scooter or a scooter for toddler boy. It is ideal for children aged 3 and up. Designed with new riders in mind, this scooter features a friendly three-wheel design that will enable your little one to explore and develop new skills easily and comfortably. The large front wheels ensure stability whereas the ABEC 5 bearings and the high-rebound PU material deliver a smooth ride and durability. Since the first experience with a scooter is a challenge as far as keeping balance is regarded, this model comes with a steering lock mechanism that will keep the scooter moving in a straight line. When you feel it is the right time for your kid to steer, you can simply unlock this mechanism. The handlebar can be adjusted from 26.5 to 31 inches and can thus meet the needs of children aged 2 to 6. It has a weight capacity of 110 lbs and a steel plate reinforced deck for increased support, stability, and durability. Designed for kids aged 2-5, this scooter bike for toddlers is worth paying attention to if you want to boost your little one’s fun and do so safely. That’s why it comes with a three-wheeled design that will provide the toddlers with the balance needed to ride without their safety being affected. The T-handlebar height is adjustable to ensure a comfortable ride and to accommodate kids as they grow. Balance is further enhanced by the low-ground-design deck. The materials used including high-quality stainless steel and polypropylene plastic promise to keep up with extended use. The unit also features light-up wheels to help the user see the path in the dark. The scooter has a maximum weight capacity of 80 lbs, which means it would make a great gift for toddlers aged 5. It is lightweight and easy to carry. Plus, the item is available in blue, pink, and green. A toddler scooter should help the user develop coordination and balance skills and do so in a safe way. That’s what Radio Flyer had in mind when designing this beginner scooter. Ideal for 2 to 5-year-olds, this model comes with features that will pair your kid’s fun with comfort and safety. It thus boasts a wide low-to-the-ground base and two larger front wheels for enhanced stability. Moreover, the turning radius was designed in such a way to ensure extra safety without affecting mobility. To further enhance safety and add traction and stability, the unit comes with a textured deck and comfortable hand grips. 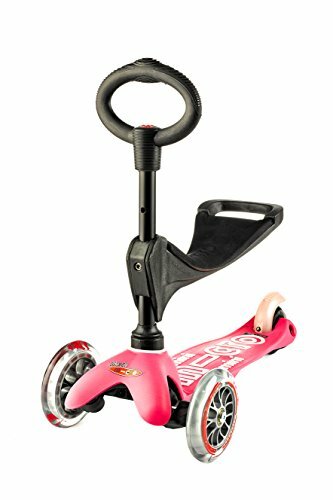 The foot brake is easy to use and helps the toddler enjoy more control. The beginner scooter has a weight capacity of 50 lbs, measures 11.6 x 22.8 x 27 inches, and weighs 5 lbs, which makes it comfortable for toddlers within this age group to use it. In case you’re looking for a scooter for a very young rider aged 15 months to 5 years, this model from smarTrike might be right up your alley. The toddler scooter bike was designed to accommodate toddlers as they grow, therefore, it comes with an adjustable telescopic handlebar. The seat is also adjustable and removable, which means that you can leave it on for the first few rides. Once your little one gains confidence and more control, you can easily remove it. The product also comes with a unique T-lock that provides the user with two scooter action modes. To further enhance the rider’s experience and comfort, the scooter boasts a non-slip rubber foot deck that will provide more traction as well as soft rubber grips. Because safety and control go hand in hand, the item sports a rear brake that is easy to reach and use and that boosts the toddler’s control over the scooter. Kids love to scoot and while such an activity might seem just a kid’s way to play, riding a scooter actually plays an important role in the development of motor skills. It will help your little one develop balance and coordination skills, explore, and gain confidence. However, finding the best scooter for toddlers is not an easy task, considering the many expensive and cheap scooters for toddlers available for sale. To narrow down the extensive list of options, you need to consider not just your kid’s particular needs but also a few features that prove to be crucial as far as safety and ease of use are concerned. Scooters come in different designs. If this is the first scooter for your toddler, then a three-wheeled model is recommended. Such units were specifically designed with the needs of a beginner in mind and thus provide the rider with the needed balance and stability. Now, you will find models that have either two front wheels and one rear wheel or two rear wheels and one front wheel. Many parents choose a model with two front wheels as it is easier to be controlled by a beginner. It is best to try out one of the two versions and see which one fits your kid’s needs and experience better. The three-wheeled scooters are divided into models with a bicycle-steering type and models with a lean-to-turn design. The first ones are the easiest to use and might be a better choice for beginners. In case your kid has already gained some scooter riding experience, you might want to consider a two-wheeler. The riders will have to step on it and do all the cool and crazy stuff on their own. Keep in mind, though, that such a model is suitable for riders who have no problem with stabilizing the scooter. Another question that comes to a parent’s mind regards the scooter type. Should it be a toddler electric scooter or a manual one? The answer depends on what you want the toddler to learn from such an experience. A manual scooter will help a toddler gain more dexterity and strength. As a learning “toy”, a manual model thus has more to offer. However, an electric model should not be ignored, though. It will still help your kid learn new skills and explore more with greater ease. Once you’ve decided that your toddler is ready for a scooter, it is important to make sure the model you buy suits your kid’s age, weight, and other specific needs. A customizable model is desirable. 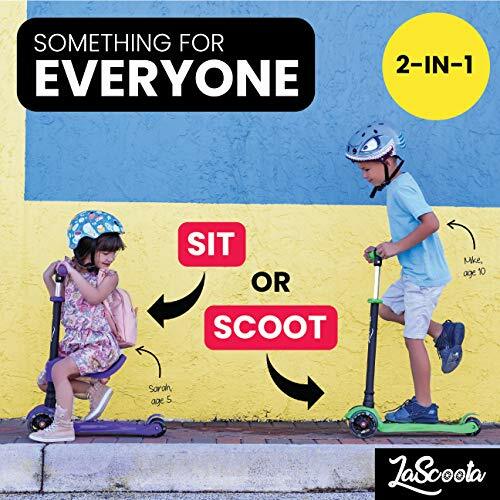 A scooter that features an adjustable handlebar to match your kid’s height comfortably and an adjustable and removable seat is ideal. The seat can be used until your kid gets the hang of riding the scooter. As your little one grows, you can remove it and let the young rider rely only on the handlebar. Also, a wider base is recommended as the rider can keep both feet on. Check the overall design as well as the materials used before you buy. Make sure the unit is safe to use as this is the no.1 priority. Enhance your kid’s safety with the right gear including a high-quality helmet and shin, knee, and elbow pads. The market offers scooter models that come with brakes and models that lack such parts. 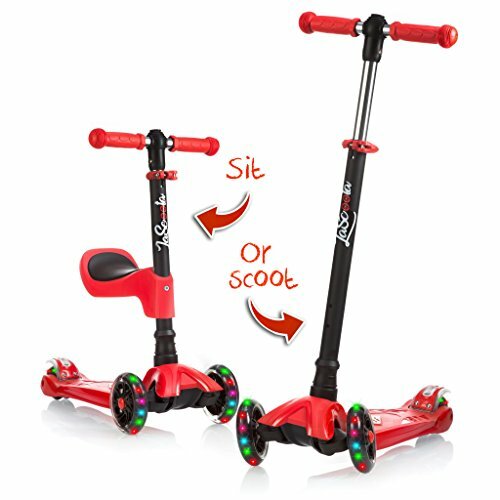 Since we’re talking about a scooter for toddler girl or boy, it is safer to choose a model that does feature brakes. A model without brakes means that the toddler should manually slow down using the feet. That might be a bit challenging and risky, given the fact that a toddler is still developing various skills. It is thus not only easier but also safer to get a scooter with brakes. When the need arises, the rider will only press the brake to stop. The way the unit is built and the materials used count a lot, too. They will directly affect your kid’s safety. Consider a product that uses high-quality materials that don’t risk breaking while your little one is riding and that will keep up with extended use and even with bumpy surfaces. Plus, don’t forget about your toddler’s comfort when riding. Check out the grips and the material used for them. Many appreciated models boast soft rubber grips for comfortable riding. Are scooters good for toddlers? Yes, scooters are good for people of any age, but especially for toddlers because this is the age when kids learn how to balance using their weight. 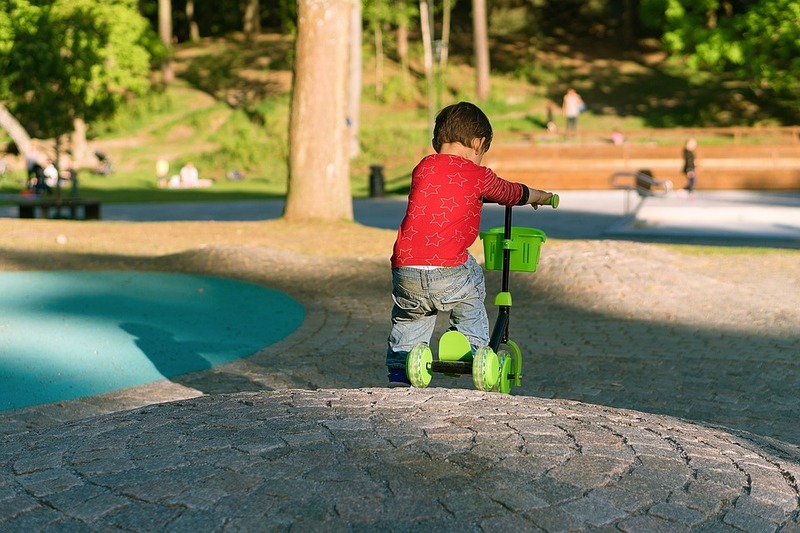 Balance and coordination skills are developed in the early stages of life and using a scooter will provide the toddler with various benefits as far as this aspect is regarded. Both gross and fine motor skills are then developed and they enable the kid to gain and enjoy greater independence when engaging in different activities. They will thus learn to make sense of their surroundings, explore an area, and control an object while moving, which further translates into confidence to tackle other skills, too. Scooters are safe for toddlers as long as they feature a safe and easy-to-use design, they are ridden the correct way, and the rider knows and understands safety measures and wears the appropriate safety gear. Therefore, opt for a scooter that was specifically designed for kids of your little one’s age and that comes with a wide low-to-the-ground deck, three wheels, and an easy-to-use rear brake. Outfit your kid with quality shin, elbow, and knee pads as well as with a quality helmet. Show your child the safety features of the scooter and how it works. Plus, watch your little one while riding. Yes, a toddler needs a helmet when riding a scooter. There’s no debate as far as this safety measure is concerned. While the shin, knee, and elbow guards are also compulsory, the helmet holds the greatest importance when it comes to the safety of your child. Incidents can occur anytime and anywhere, even if your toddler has already gained some scooting experience. To prevent such unwanted happenings from causing serious damages, your young rider should be backed up by a tough helmet. Opt for a high-quality one to enjoy maximum protection and make sure your child wears it appropriately.